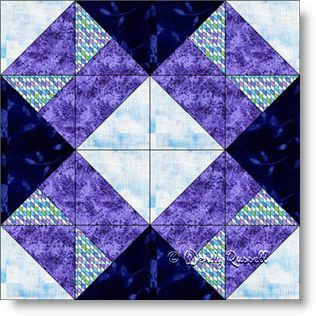 Aunt Nancy's Favorite (or as I prefer to spell it ... "Aunt Nancy's Favourite") is an easy to intermediate level quilt block to produce. This four patch block is only difficult due to the number of pieces used to create the block. But, it is well worth the effort. The quilt block contains only half square triangles and the smaller units, the quarter square triangles, but nothing is difficult if you pay close attention to the precision of your quarter inch seam allowances and note that some of the patches are mirror images (where the quarter square triangle pieces are used). As illustrated in the sample quilts drawings shown, you can create a special heirloom that would look totally different than one made my your friends. Imagination and colour placement are all that is needed.